A new opinion poll shows that the voting intention rate for New Democracy is 25.8% against 15.6% of SYRIZA, while eight out of ten Greeks give a negative review of the government’s performance in the past two years. 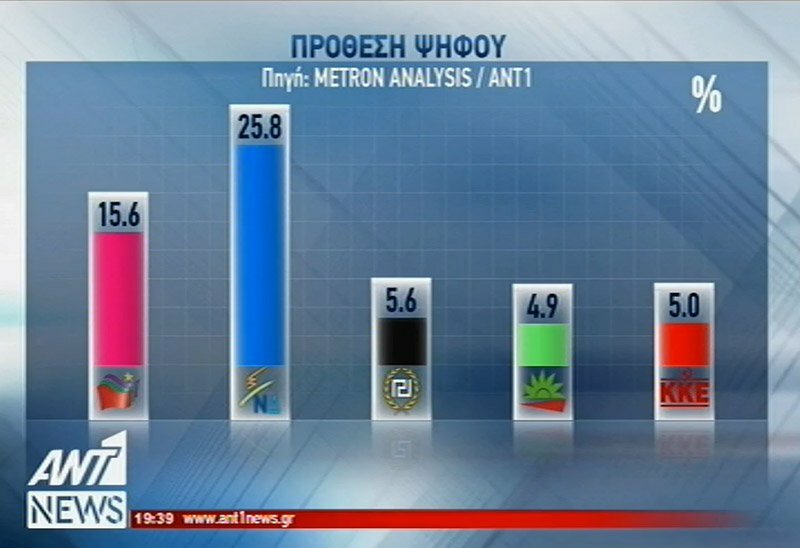 The survey was conducted by Metron Analysis for ANT1 news. The results confirm the trend of the past several months, ie a turn of voters to the conservative party. They also reflect the Greek citizens’ frustration against government policies and the prevailing uncertainty in most aspects. However, 25% of respondents said they do not know who to vote for if elections were held on Sunday. Golden Dawn is steadily the third party in voting intention with 5.6%, followed by the Greek Communist Party (KKE) at 5% and Democratic Coalition (PASOK-DIMAR). The remaining parties would not make it to parliament if elections were held today. Specifically, the Centrists Union received 2.3% of potential votes, the Independent Greeks (ANEL) 2.1%, To Potami 1.7%, Popular Unity and Plefsi Eleftherias at 1.5% each and ANTARSYA 1.1%. Regarding the person most suitable for prime minister, an impressive 46% responded “no one,” with ND chief Kyriakos Mitsotakis getting 21% and Alexis Tsipras 12%. A nationwide sample of 1,005 people were polled and 81% gave a negative review of the government’s performance, while only 17% appeared satisfied with the administration’s work. Also, regarding the question of the return to the drachma, 31% of Greek citizens (and 39% of SYRIZA voters) are in favor of a return to the national currency, while 64% strongly support the view to remain in the euro zone. On the negotiations with creditors, 79% of respondents said the government is handling negotiations poorly and only 16% replied that the government is doing a good job at the negotiating table. Finally, 60% of participants said that developments in 2017 will be rather unpredictable, indicating the uncertainty the majority of Greeks feel.